Judy Collins, interviewed by phone. Still friends after 50 years-Judy Collins and Stephen Stills are on a national tour, which comes to the Gillioz Theatre September 20. Judy Collins and Stephen Stills had a famous—and, as both readily acknowledge, tumultuous—romance in the late 1960s. It didn’t last, though it did inspire one of the best known songs of the era, “Suite: Judy Blue Eyes,” written by Stills and performed by him, along with his then-bandmates David Crosby and Graham Nash. But the friendship between Collins and Stills has endured for more than fifty years. 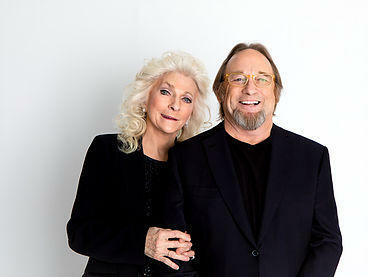 Now, a half century later, Judy Collins and Stephen Stills have finally recorded a CD together called “Everybody Knows.” And they’re in the middle of a national tour that will bring them to Springfield’s Gillioz Theatre, 325 Park Central East, for a concert Thursday September 20 at 7:00pm. Not only did Judy Collins study piano with a world-class musician, she’s classically trained as a vocalist as well. “Oh, absolutely. I studied with a great teacher for 32 years in New York” starting in 1965. “While everybody else was hanging out at Max’s Kansas City (the famous New York City pop/punk music/poetry nightclub and restaurant), I was standing in my teacher’s living room doing scales and exercises!” And she’s glad she did. Money does perhaps play its part in Collins settling down and writing an extensive biography of Antonia Brico—she noted with a laugh that “I’d need to have a Fulbright scholarship to do that!” The other (possibly bigger) problem is finding the time in her still-busy schedule, which brings her and lifelong friend Stephen Stills to our own Gillioz Theatre this month. Tickets for the Stills/Collins concert at the Gillioz on September 20 range from $49.50 to $124.50, and are available by calling the Gillioz box office at (417) 863-9491 or at http://www.gillioztheatre.com.